We lead the Coordinated Entry System for Families on the Westside and work closely with our partners in other areas to provide seamless services for homeless and at-risk families with children. Services include rapid re-housing with short-term rental assistance, referrals, and case management to assist families in securing and maintaining safe, stable permanent housing, ideally in (or near) their own area — close to school, jobs, family, and community-based services. Our Permanent Supportive Housing services assist homeless men, women, and families in securing and maintaining voucher-based apartments. We provide case management and other services that promote stability and self-sufficiency. 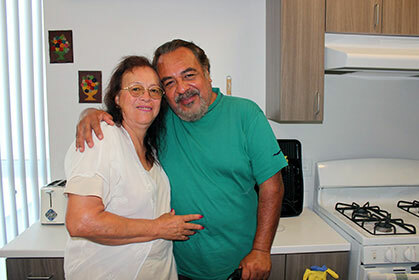 We work with households living in units owned by individual landlords and we act as the Lead Service Provider at various affordable housing developments around LA County. Some programs target specific populations, including high utilizers of LA County public health facilities as well as people dealing with mental health and substance use issues. Rapid Re-Housing provides move-in assistance and short-term rental subsidies along with case management and supportive services to households on the Westside and in South LA. These programs are designed to serve individuals, youth, and families who have relatively fewer barriers to self-sufficiency and are capable of quickly regaining and sustaining stability.